Rated 4.6 out of 5 stars.31 total votes. Searching for the perfect accent chair to add to your living room ensemble or dining room table? Look no further than this one, which features a contemporary silhouette. 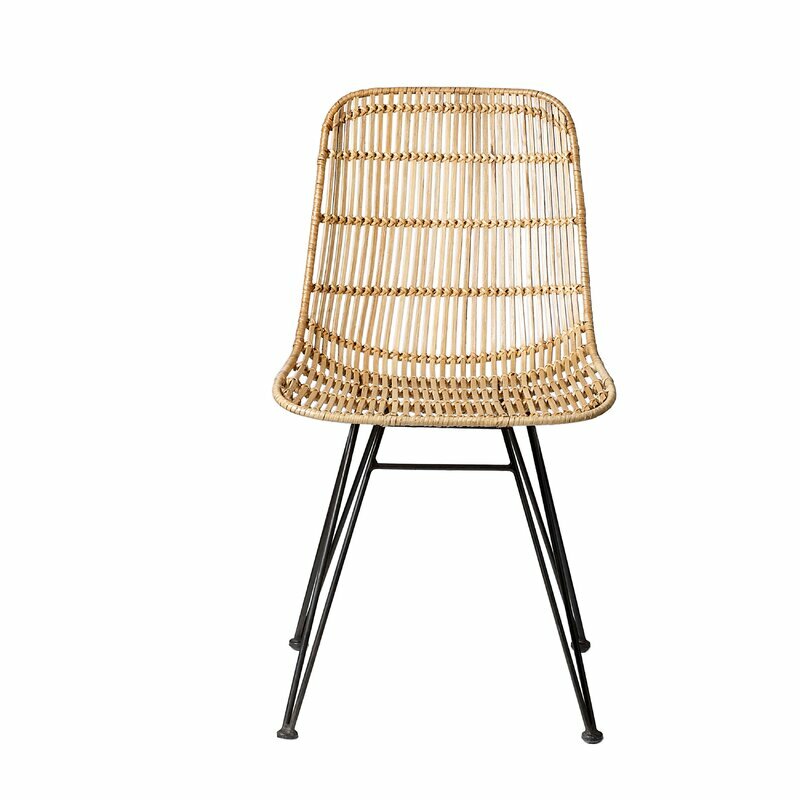 Founded atop a black metal frame, it showcases a woven rattan design, perfect for adding to boho and eclectic abodes alike. It sits atop four metal legs, which add to its contemporary look, balancing out the low-key neutral styling. Measures 31.5'' H x 17.75'' W x 22.5'' D.
When you buy a Mistana Edmond Side Chair online from Wayfair, we make it as easy as possible for you to find out when your product will be delivered. Read customer reviews and common Questions and Answers for Mistana Part #: MTNA2115 on this page. If you have any questions about your purchase or any other product for sale, our customer service representatives are available to help. Whether you just want to buy a Mistana Edmond Side Chair or shop for your entire home, Wayfair has a zillion things home. Good price. Not the most comfortable, but adding a shag helps. Beautifully simple and a great price! We are using it on our kitchen nook. Chair is beautiful, wicker is painful on bare skin. Good quality , sturdy chair ... looks great in my daughters room. These look good and are comfortable too! Fantastic chair! Well designed and durable as well. One thing: this is actually a chair, and not the brand listed. These are super cute chairs - keep in mind they are made out of twigs basically, so don't stand on them, but they look really cute in person. Rated 4 out of 5 stars.991 total votes. Whether pulled up to a desk or stationed in an unused corner, this versatile arm chair is the perfect pick for your teen’s space. Drawing inspiration from mid-century modern designs, this piece is founded atop four slender and splayed steel legs to sit just 18" tall. Foam padding and solid-hued polyester upholstery envelop the square seat, flared arms, and low back for a streamlined and on-trend look. Assembly is required. Rated 4 out of 5 stars.43 total votes. Perfect for creating a peaceful oasis beneath the pergola, in your bedroom, or as a spare seat in the living room, this 32'' H x 31'' W x 28'' D accent chair brims with boho flair. Showcasing a classic papasan shape, it's crafted from rattan in a natural hue, and founded atop a neutral metal base with four unobtrusive legs that allow its woven and bohemian seat to shine. Assembly is required for this design. Contemporary chair crafted from iron and rattan features a square seat and a slanted oval seat frame with uneven horizontal embellishments, supported by 4 black-footed legs with an X-shaped brace. A stylish addition to any room, this button back accent chair is as comfortable as it is beautiful. Its vintage-inspired, button-back design Perfect for use as a dining chair, office chair, or accent, this nicely scaled multifunctional chair makes a unique statement in style. Nailhead detailing distinguishes its seat edge. Rated 4 out of 5 stars.3 total votes. This contemporary, yet retrofitted chair is the perfect simplistic addition to any household. With it's streamlined, armless appearance this fabric chair will seamlessly slide into any existing home decor, but also add a pop of elegance. It's cross-hatched patterned fabric gives the chair a modern flair inviting anyone to sit upon its comfy padded seat providing optimal comfort and satisfaction. This fabric chair is the perfect addition to any dining, office or living area. This Maven Side Chair transforms your space without a total design overhaul. Enticing polka dot pattern adds a splash of color to your home. High-leg design is ultra fashion-forward and sturdy. Tufted back with button trio supports you in comfort. Complete your parlor or den ensemble with this essential design, perfect for extra guest seating or lounging with a Sunday-morning cappuccino. Decorate your room with these American luminaries. Great for adding a special decorative flair to fourth of July - Memorial Day - cocktail parties and special premier events. Let your patriotism shine through on fourth of July or any other holiday with this high heel shoe ottoman with patriotic flag motif in true red, white and blue. Product features: Durable and sturdy construction with American Flag style designs.